Home prices here in Boise, Idaho and the Treasure Valley have continued to climb in the past few years, and there are three three main factors that continue to drive housing demand here in Ada County. Increased economic development in the valley, a limited housing supply, and a growing population. These three top factors resulted in a new record high median sales price last month in August of $278,000, which is up 9.6% from a year ago. Now while the average home prices have continued trending upwards, the rate at which they have has also has been slowing down which is a healthy indicator for our market. An example of this might be if you were driving your car up a hill, as the road started to get steeper, the speed at which you are driving would begin decreasing. You would still be gaining ground, just not as quickly. 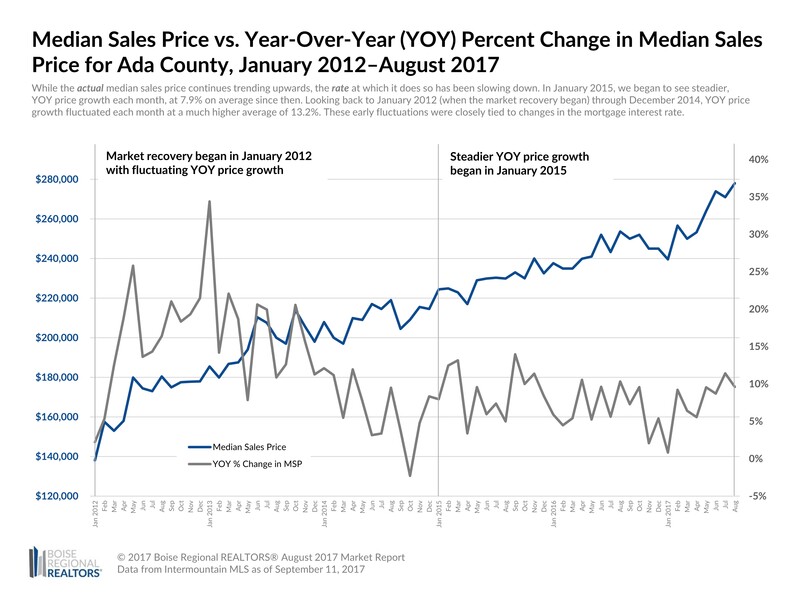 Now if we go back in time to January 2015, the Ada County real estate market began to see year-over-year price growth each month, at 7.9% on average through August 2017. Looking back to January 2012 (when the market recovery began) through December 2014, year-over-year price growth fluctuated each month at a much higher average of 13.2%. These early fluctuations were closely tied to changes in mortgage interest rates. In summary, our market outlook looks healthy at this time. Rising home prices are ideal for people who are selling their home and for our economy overall, but eventually, this can cause affordability concerns for home buyers, even with low the mortgage interest rates still available. Slowing house price increases could be an early indicator of the market coming back into balance, however, long as the buyer demand outpaces the number of homes for sale, that low supply vs. high demand factor could very well keep home prices on the rise. Now let's not forget about Canyon County. This market is experiencing the same slowing price growth that we see in Ada County. If we look back from January 2012 through December 2014, the average home sales price increase was 18.9%. The average home sales price in Canyon County for August 2017 was not a new record like it was in Ada County, but it was up 11.0% from August 2016 at $183,000. Should you have questions about buying a home, selling a home, or anything else, please give us a call at 208-501-8200.